This file attachment in a OS X style trash bin was just so darned cute, I had to have him. Files have feelings too, you know. Unlike the actual OS X trash can though, this bin is for recyclables. You see? 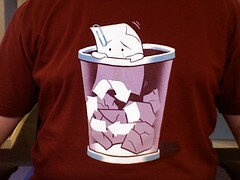 As well as wearing a groovy t-shirt with a very cute piece of paper on it, I’m also making a social statement – recycling is good. Of course, the little TPS report dude isn’t going to be too happy, being pummelled down into pulp and all, but what can he do about it? Anyway, he’ll probably get turned into something far cooler, like a wonderbra advert from the 90s that causes people to crash their cars. Or maybe a post-it note. Whatever happens to him though, I’m sure he’ll be happy that you chose to buy a t-shirt that immortalised him. 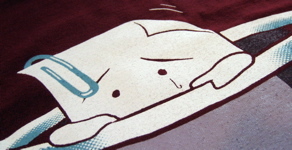 “Mr File Attachment got Dumped” is available from uneetee for $17.99 and is printed on an American Apparel t-shirt.